Darren Carrington was ineligible for the national title game because he failed an NCAA drug test; he tested positive for marijuana. However, according to Carrington’s father, Darren Carrington Sr., his son wasn’t smoking at all, but rather, the failed test was the result of secondhand smoke. Carrington Sr. played eight seasons in the NFL and started for the Chargers in Super Bowl XXIX, so Darren’s father knows what it takes to be a top-level athlete. As for Carrington Jr., he certainly looked to be an impact player prior to the game against the Ohio State Buckeyes. But, it didn’t play out that way. Carrington was a big-play threat in the Rose Bowl. Carrington Jr. tested positive for 15 nanograms of THC per milliliter of blood — anything over five nanograms is a failed test in the eyes of the NCAA. The amount for a positive test skyrockets for professional sports: 35 nanograms for the NFL, 50 for the MLB, and 150 for international track & field athletes. If you ask me, five nanograms seems a bit ridiculous when compared to those sports. Lets face it; this is college we are talking about. Of course I don’t condone Carrington’s behavior, especially leading up to the biggest game of his career, but secondhand smoke isn’t completely out of the question. Allow me to play devil’s advocate for a moment. These athletes are at the top of popularity on campus. Whether you agree with it or not, that is a fact. The majority of them go to campus parties with other athletes, sometimes to party and sometimes to just chill. I’ve seen both first hand many times (I’ve also seen several athletes at the campus bars, even though they aren’t yet 21). It is possible, however improbable, that Carrington was just hanging out in a room where people were smoking. It’s also possible that room got fairly smoky; this is Eugene we are talking about. 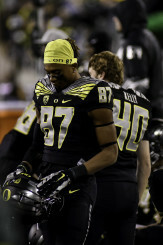 Carrington scored his first touchdown as a Duck against Stanford. I know what you’re probably thinking; ‘He’s an athlete he should be at home studying film, and he shouldn’t be at a party before the big game. He shouldn’t be around that.’ While you may be correct, he is entitled to live a normal college life. If he has finished his studies and fulfilled his athletic duties, why can’t he hang with some friends? As marijuana becomes more socially acceptable, and legal in more places across the nation (including in Oregon this July) more and more people will begin to use the substance. So maybe Carrington wasn’t using it at all, but some of his friends were and he is in fact the victim of secondhand smoke. “Unfortunately sometimes you feel like ‘if I’m around friends and their doing it, as long as I’m not doing it I’m good,'” Carrington Sr. said. ”Sometimes you have to be that guy who gets up and removes himself,” he went on to say. According to Sterling Healthcare Services, a toxicology collection lab, “Levels below 100 ng/ml are relatively low and would correlate with light use.” Carrington only tested at 15 ng/ml, so secondhand smoke in a fairly smoky room the night before is actually possible. But either way, secondhand smoke or not, he has to understand the situation and the risk he was putting himself in. I’m sure he does now. Especially after the talk with his father. Carrington could miss time next season due to the failed test. The impact this failed drug test could have on Carrington’s next season is still uncertain. Carrington Sr. said the family is looking into appealing the failed test and also any possible suspension in 2015 regarding the incident. The University of Oregon already appealed Carrington’s ineligibility leading up to the title game, and was denied, so it’s unclear how effective a second appeal would be. Carrington has the potential to be a big playmaker for the Ducks next year, but with Bralon Addison returning from injury, Dwayne Stanford continuing to improve, and young athletes ready for their chance to play, Oregon should have plenty of talent at receiver, with or without him. Hopefully the sophomore-to-be has learned his lesson and will either stop smoking, or stop sitting in hot-boxed rooms with buddies who do, during the season. He needs to put this behind him, work hard and build from his great post-season run if we want to remember his name for his play, not his failed drug test.